Madelyn is a two-year-old girl whose vigor and goofy personality has earned her the nickname “Little Bulldog.” She loves wearing superhero capes and building forts with her older sister, Callie. These activities were put on hold when Madelyn was diagnosed with stage three neuroblastoma in October 2016. Multiple surgeries and treatments at several different hospitals not only took a physical toll on Madelyn, but also a financial toll on her family. Madelyn’s parents realized the severe financial impact of cancer soon after her diagnosis. Numerous extended hospitalizations required her parents, Angela and Kevin, to significantly reduce their hours at work. Angela eventually had to stop working completely to devote her time to caring for her daughter. Kevin was only able to go into work when Madelyn’s treatment schedule allowed for it. The high volume and unpredictability of appointments made maintaining a job extremely difficult. Accompanying the dramatic loss of income were 80-mile round-trip drives to Madelyn’s frequent appointments. The family constantly worried about having enough fuel in the tank to last until the next payday. They found themselves struggling with balancing bills and other everyday expenses. Madelyn is one strong "Little Bulldog"! The family’s social worker recognized their tremendous need for help and contacted Family Reach. Thanks to the assistance of our supporters, Family Reach was able to issue a grant to Madelyn’s family. This aided them with several mortgage payments and other expenses. 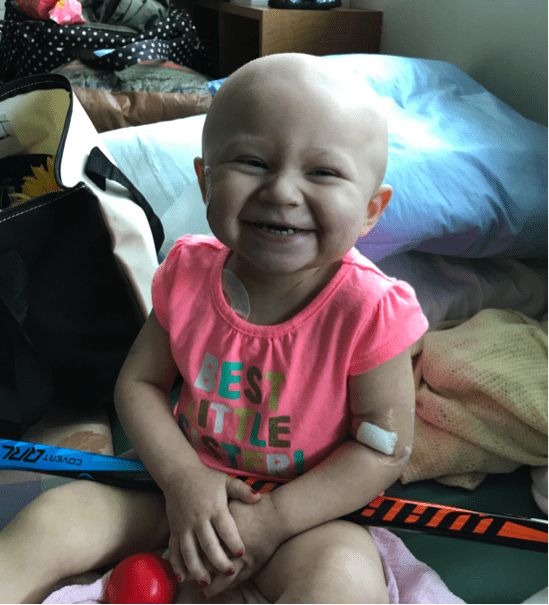 Madelyn has successfully completed treatment and is currently in remission! She continues to receive various tests and is beginning another therapy soon to ensure her cancer does not come back. This brave Little Bulldog remains in our thoughts! To be a financial lifeline for families like Madelyn’s, click here.